The ladies’ section coffers are becoming exceeding low, so we have had to raise our Competition fees from R15 to R20. It’s the first fee increase for around 5 years, so we hope it won’t break your bank! In line with the new global handicapping system, new scorecards will be introduced during October – just as soon as the current ones run out. The stroke indices from all 3 tee-boxes will then be the same. Let’s hope that our two difficult par 3’s (2nd & 12th) will have a less punishing rating! Please be on the tee box 10 minutes before your tee time. Players who cannot stay for prize giving should please make their apologies to the Lady Captain or a member of the Committee beforehand. To make life easier for yourself & the Green Fees office staff, please observe the request to put your names down for Thursday Competition by 2pm on the Wednesday. Please make sure you have (& fill) a sandbag and that you use it on the course. If you are playing a casual round, or in one of the Tuesday ladies groups, for example, please don’t forget to place your scorecards in the box in the ladies’ locker room so that the Committee can monitor how the new handicap system is working. A new ladies’ competition, a betterball knockout championship, has been introduced this year & will run from October through to April. It costs R50 per pair to enter (payable to Judith Flevill). So, find a reliable partner, and write your names on the entry sheet in the ladies locker room. Barbara Bevan is also sponsoring a new Order of Merit Trophy. This will run for 8 months, starting with the October Stableford. There is no entry fee, as your scores will be automatically ‘captured’ & collated by Judith. Each competition winner will be awarded 10 points, the runner-up 9 points, 3rd 8 points, etc., so the lady with the most points at the end of the season will receive a trophy. And don’t forget…a members’ draw & supper night is held on the last Friday of each month! (8.30 shotgun start. The poster & entry list will go up on 1 November after prize giving. Unfortunately, the SC Amateur & Junior Champs at Knysna were poorly supported by local players & those from further afield – due, in no small measure, to the forecasts of adverse weather conditions! Knysna fared well as Suzette du Preez won the Nett and came third overall in her division and Wendy du Toit was counted out of 1st by Bex Pienaar and into 2nd place in her division. Jenny Frost, Tanya Lightley & Lizzie Lightley also took part. The visitors were very complimentary of our clubhouse and course facilities, hospitality and staff and the tournament went off well despite cold & windy weather early on the morning of the second day. Thanks to those who played and supported the event as well as the staff both on the course and in the clubhouse. The 30-odd members who attended the Blind Winetasting on Sunday September 9 were greeted with a mind-boggling selection of 21 wines to sample, including a small number of the club’s current (and most popular) brands. Each wine bottle was covered, numbered & bore the grape variety & the price per glass & per bottle – at members’ discount rate. Our willing guinea-pigs were each given a tasting sheet to rate each wine as follows: Excellent, Good, Indifferent, Disliked, Did not Taste. At the end of the exercise, the tasting sheets were collated & points awarded: 3 points for excellent, 2 points for Good, 1 point for Indifferent & 0 points for disliked or Did not Taste. The results were interesting & quite surprising! A couple of our existing wines scored very well & will remain on our list. Others that we thought would score highly actually scored poorly & will be phased-out. The upshot is that, as soon as existing stocks run out, the new wines chosen will be introduced over the coming weeks. The staff have started entering them on the POS & and the Club Manager is ordering 2 cases of each new wine now, as he is going on leave shortly. These will be available when most of the old wines are finished & a new wine list will be produced. Meanwhile, a sparkling wine will be introduced immediately. It’s a D’Aria “Popsong” sparkling sauvignon blanc. It will be available (by the bottle only) at R104. The Graham Beck MCC will remain on the list for those who like to splash out!! So ladies, get drinking & use up the stock soon!! Vice-Captain Julia Read is organising a Suggestion Box for the Ladies Locker Room for you to offer suggestions, constructive criticism, etc. for the Committee to consider. She will also organise a box for the donation of toiletries for the residents of the Vermont & Loeriehof elderly care homes at the Green Fees Office from mid-October. Listen out for further announcements at forthcoming prizegivings. 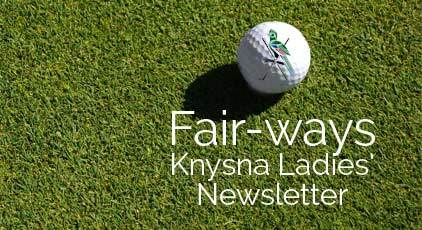 Anyone wanting to donate prizes/sponsor nearest the pins or golf days / competitions please contact Wendy du Toit on 081 555 5510. The Lady Captain will be overseas from 3 – 21 October (lucky you, Wendy!) and will leave the ‘officiating’ in the capable hands of Sunet, Julia and Judith while she’s away.